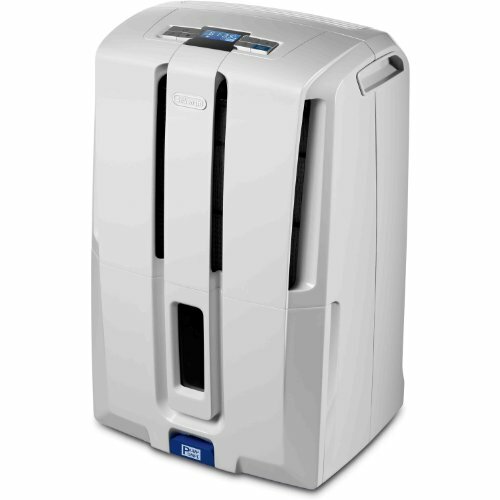 The DeLonghi 70-pint dehumidifier with patented pump features a worry-free pump function that allows the unit to continuously discharge moisture without constantly emptying a bucket. The unit can pump water upward to drain out a basement window or into a sink, up to 16 feet with the provided hose. The electronic controls and LCD display allow you to adjust relative humidity, monitor room temperature and set the 24-hour timer. With its frontally located tank and transparent water level window, you can easily see how much water has been collected if you choose to use the tank function. The tank has a 6-liter capacity and an alarm alerts you when it is filled.